Mike Zimmer's Vikings have always been known as a ball-control team but they've been taking more risks in new coordinator John DeFilippo's offense. Is this an issue? 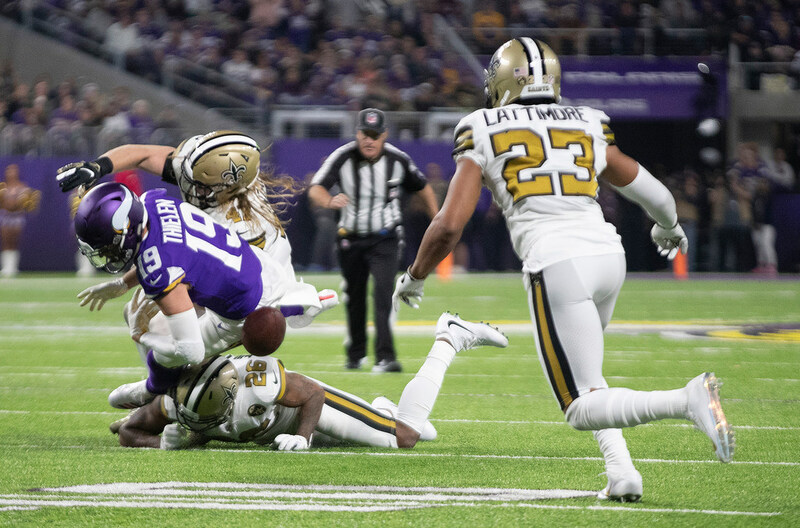 *The buildup to Sunday night’s game between the Vikings and Saints meant all of us got to watch multiple replays of the Minneapolis Miracle and relive the glory of Stefon Diggs’ catch that gave Minnesota a playoff win over the Saints in January. But Sunday’s itself, a 30-20 victory for the Saints, unfolded much more like a different previous playoff matchup between the two teams. The Vikings on Sunday outgained New Orleans 423-270, held the ball longer and generally were the more dominant team. But gut-punch turnovers — including one right before halftime — completely changed momentum and told the real story of the game. Sound familiar? That was the cruel script in the 2009 NFC title game, when the Vikings outgained the Saints 475-257 but were minus-four in the turnover department in a 31-28 loss. The Brett Favre interception near the end of regulation was the final cruel turnover twist, but the botched handoff between Favre and Adrian Peterson near the goal line at the end of the first half — with the teams tied 14-14 — was costly as well. On Sunday, it was Adam Thielen’s fumble that turned what seemed destined to be a 20-10 or 16-10 Vikings halftime lead into a 17-13 deficit and set the tone for an ugly, mistake-filled second half. *The Vikings, by the way, have turned the ball over 11 times through eight games. That’s not an egregious number — it puts them a little better than the middle of the pack in the NFL — but it’s a pace for 22 after they had just 14 turnovers a year ago (third-fewest in the NFL). I like that the Vikings have recognized the need to take a few more chances this year — including fourth-down attempts against a top offense like New Orleans — but their identity right now seems to be muddy. Are they a Mike Zimmer ball-control team based on defense or are they a John DeFilippo team willing to gamble more? The ideal answer is “both,” But I’m not sure the Vikings have achieved that balance in a positive way yet. *In case you missed it, the Seahawks clinched their 28-14 win over Detroit on Sunday with a very unusual play that would have looked awful if it didn’t work (except it did). Pinned at their own 3 and forced into punting formation near the end of the game, the Seahawks called for punter Michael Dickson to run out of the end zone for a safety. But he started running to his right, saw open space in front of him and took off — gaining 9 yards on the 4th-and-8 play to pick up a first down and let Seattle seal the game. Should the Wolves be considering Houston's offer for Butler?